My son has always loved outdoor rock climbing but has never shown much interest in the indoor variety. Fortunately, my husband is an experienced climber with the knowledge, training, and gear required for a family day at the crag. We also have a great group of friends who like to climb so we can meet up with other families for an evening of family climbing after work. I don't know if my kids would like it. Would they be safe? Is there protocol to follow at a crag to ensure happy relationships with other climbers? Is it a family-friendly environment at most crags? 1. Build your skills inside first. The University of Calgary Outdoor Centre offers classes that will help you transition from indoor to outdoor climbing. With sessions like "Outdoor Transition," and "Complete Learn to Lead," you can build your skills at the gym and then move outside with confidence next summer. The Calgary Climbing Centre also offers lessons (including family lessons) throughout the year at their facilities across the city and Yamnuska Mountain Adventures offers programs as well that will teach you to climb and lead outdoors. Finally, I highly recommend joining the Alpine Club of Canada if you're serious about climbing. This past summer, the ACC Calgary section offered a cool program called "ROCK-IT! Real Outdoor Climbing Knowledge Introductory Training Program." Kids were allowed to tag along with adult's taking the weekly classes and if I'm correct, it was FREE for ACC members. The program was amazing from what I heard and it introduced all of the skills required to climb outside. Hopefully the ACC offers this cool program again next summer. Unfortunately most of these groups won't run too many programs over the winter, but you can find the program that would work best for you and plan to sign up next spring so that you're ready for outdoor climbing next summer. In the meantime, practice your indoor climbing so that you'll be comfortable on the wall when the time comes to move outdoors. If you'd rather go outside with a guide or with an organized group, check out the University of Calgary's Outdoor Family Climbing Sessions next summer. They provide all of the equipment and set up the top ropes so you can just have fun climbing as a family.They also offer Rock Weekends where you can build your skills from indoor to outdoor climbing in a weekend. With an extra day you can try multi-pitch climbing for a day with guides from Yamnuska. Finally, the Alpine Club of Canada organizes both indoor and outdoor climbing events through their local sections where you can learn from other members with more knowledge, gear, and experience. 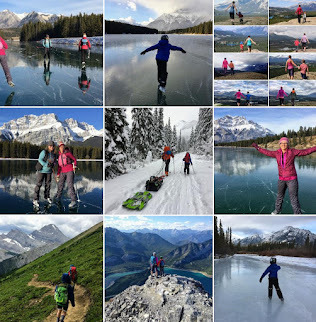 We're members of the Calgary section and can join up for climbing, scrambles, mountaineering, and even the odd family backcountry trip. When we go out climbing with friends, we always allow novice climbers to come with us. The requirement is that you bring at least one harness for your children to share (ideally one harness per child climbing,) that at least one adult per family can help with belaying (and has their own harness, belay device and locking carabiner,) that you bring helmets for everybody in your family (even a bike helmet for the first time or two out,) and that ideally, if you have a rope, you bring it. If not, we share ropes amongst the group. You'll learn where to go and can benefit from the guide book your friends probably have showing all of the routes at the local crag. You can brush up on your technique, get some mentoring in the finer points of safety and attention to detail, and even practice your belaying while a more experience climber supervises the first couple of times. Once you are ready to try leading, friends can help you here too and can give you reminders on anything you may be rusty with. Going with a group gives you "supervisors" on the ground for kids who aren't climbing. It also gives you plenty of adults to carefully monitor younger children who may be hanging out, but not climbing much yet. If you're going to join a club trip or are going to go out with a group of friends, you'll need the following: One harness per member of your family that is climbing or belaying, a belay device per adult who is climbing with a locking carabiner, and a helmet for everybody in your family. Ideally, you'll invest in your own gear but you could rent the above items for your first time or two out. Ideally you'll also invest in real climbing helmets! Bike helmets can be used but are not advisable as they are designed for side, front and back impact and not rock fall which is more common than actually falling on a climb and hitting one's head. The next piece of gear that you'll want to invest in is a rope. Even if you can't lead yet, bringing a rope is a good contribution when climbing with friends and shows that you are serious about getting into the sport. I find there are always two to three adults per group who can lead, but often not enough ropes for the 2-3 kids per rope ratio. If you don't want to buy a rope on your own, consider splitting the cost with friends who want to get into climbing. The rest of your climbing equipment can be built up as you develop the skills to lead and put up a route on your own. At this point, I'm going to assume you'll learn what you need to invest in through the course you're taking or through the friends who are mentoring/teaching you. We finally invested in real climbing shoes for our son. BIG difference! Long pants if possible. I cringe when I have to let my son wear shorts when climbing on hot days. It always ends bad when he scrapes his leg or knee on a sharp rock. Once your child is ready to climb a 5.6 to 5.7 route I recommend real climbing shoes. Before that kids can get by with a pair of running shoes. We recently upgraded our son's shoes and he can climb way better now! No more skiddering out on the rock, much better grip, and an easier time getting up steep walls. For us, this has been easy because we are friends with many like-minded outdoor families, many that also enjoy rock climbing. If you find yourself alone though and in need of family friends, I can offer a few suggestions. Join an adult meet up group or club and hope that some of your new climbing buddies will have kids. Eventually, you might be able to plan some family days at the crag. In Calgary, join the Calgary Outdoor Playgroup Community where many families enjoy rock climbing. 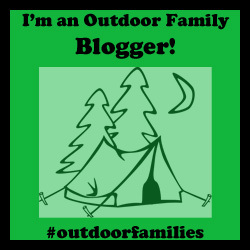 There are often posts in the group from families looking for other families to climb with. Sometimes we post official climbing events too from the group. This poor tree is usually just as popular as the actual climbing walls! 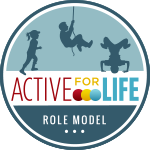 Refer back to number one (building your skills) and join an organized family climbing day, take family climbing lessons at an indoor gym, or join the Alpine Club of Canada. These are all great ways to make friends who climb. Teach the kids to stay back from the wall when they aren't climbing. This way, when somebody screams "rope," from above, you won't have to worry that they are going to be hit in the head while playing with their sand toys, oblivious to what's going on above them. Kids are a distraction when you are trying to belay or climb, and are best entertained a short ways away from the climbing wall for everybody's safety. They also should not be free climbing up the wall when it is not their turn to climb. They are either on belay and actively climbing, or they are away from the wall playing. We like to keep kids in their helmets the whole time we are at the crag. Wasootch Creek near Calgary is great with a group of children though because they can go out into the creek bed to play (ideally with an adult supervisor in case of wildlife) and wouldn't need helmets out here. Don't be afraid to tell the climbers next to your family that swearing is inappropriate with children present. In turn, be respectful back at them though and don't let your children run around screaming in their climbing space. Always always double check everything. A girlfriend of mine tells a story of how she would have died on a rappel 19 years ago if it weren't for her obsession with double checking. On her last check she caught a mistake she had made that would have definitely killed her if she had leaned back on the rope. "Climbing is an exercise in risk management, kids are distracting, and there is no room for error." Teach your children to double check their system too. They can check that their harness is on right, that their knot is correctly tied, that mom or dad's carabiner is locked and that the belay device is set up correctly (kids can and should also take climbing lessons at a local gym when old enough so that they learn their knots, learn how to belay, and learn how to stay safe at the gym or crag. If you bring your dog to the crag, please ensure that he or she is on leash, tied to something (or at the very least if you are not in a park that requires this, that your dog is going to stay put while you are climbing.) People need to pay attention while belaying and don't need your dog running out and trying to knock them over. Some children are also scared of dogs. For us, we started climbing with our son inside to see if he even liked the sport. We taught him how to come down from a climb (stressing a good "L shape" with his body,) and didn't let him get too high before ensuring he was comfortable with being lowered. We've also always made climbing about "social interaction" and "family fun" rather than about mastering a route. We climb with friends and the kids play as much as they climb. Finally we don't stress getting to the top of a route. If you want to come down, you come down. There might be some encouragement to at least "try" to go a little higher but in the end, the climber should always get to decide when they are ready to come down. Starting on short walls is always a good idea! Kids are so dang flexible!! Forced fun is no fun! If the kids don’t want to climb, they should not have to. Climbing is a "challenge by choice" activity. Climbing is scary. If the kids don't want to do it, I think it is ok for them to just watch. Expect it to take a long time to get your routes set up. Leading a route and building an anchor is no small matter. Plan for some kind of activity to entertain the kids while you take care of this. And if you have a large group of kids, it is going to take a while to get multiple routes up, and to get all kids climbing. This is where it really helps to have adults on the group supervising (yay for parents who don't climb and just come along to offer ground support,) and to bring toys or books. Have the "bug talk" before the kids start climbing. Yes, there will be spiders on the wall. Yes, you will see bugs. Just leave them alone and ignore them. If you have a child who is petrified of spiders or bugs, anticipate a short climbing day or consider bike gloves so that at least they are not touching any bugs. And last personal notes, I like to make sure we have at least one rope/route set up per two to three children so that they get plenty of opportunities to climb. I highly recommend arriving early at popular crags too if you want to claim an easy wall. Finally, if you have a child who doesn't like climbing, don't force them to spend every weekend at the crag out of loyalty to the family and "group interests." The individual is also important. If you like climbing and the kids don't, find an adult climbing group and let the kids bow out. My husband goes out mid-week after work alone with buddies and gets his adult climbing time in. Then when we go as a family, we can focus on the kids without the adults fighting for time on the wall. Whatever you do, please don't drag a reluctant child out to the crag for an entire day of sitting there watching you try to climb that 5.12 you've been working on for a month now. Make sure they're comfortable with being lowered before you go this high! The first big thing you'll need for kids is a harness that really and truly fits and absolutely can not come off over their hips (if using a waist harness.) Kids are top heavy and more prone to flipping upside down if they fall. Full body harnesses prevent this, but they also need to fit well and be sure that the kid can't wriggle out of them. My son has always worn a waist harness but we tried a couple of models before we found the one that was the best fit. We love the one we chose, the Black Diamond Wiz Kids Harness. For kids helmet, we love the Edelrid Shield Helmet because it actually FITS! I've seen so many ill fitting helmets on kids that slip around every time they look up or down, and absolutely hate the one I have for myself. But the Edelrid one never slips around and is super comfy. My son wears it for climbing and for scrambling. The cutest kids climbing helmet ever! And it fits!!! And note RE buying climbing shoes - buy them a size or two big and just use socks for now. This way you'll get more than one year out of them! And while you're at the All Out Kids site, check out the Kids Bike Gloves from ZippyRooz (I can't say enough about these awesome gloves! Review to follow soon,) the Deuter Child Carriers and Backpacks (including children's backpacks which my son desperately needs in a bigger size for overnight trips) the Kids MSR Snowshoes (going on my personal list right now,) and the Roces adjustable ski boots (two different models for younger and older children) - and also going on my personal shopping list. 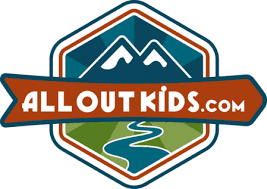 Note that there is free Canadian shipping and returns (on most items) from All Out Kids Gear. Special thanks to All Out Kids Gear for supplying us with a pair of Mad Monkey Shoes from Mad Rock for Review. All other climbing gear has been purchased on our own and we are not sponsored by any climbing company. All opinions are my own and I was not paid to write a favorable review for any of the gear that we use while climbing. Great article sharing this blog. All information is helpful and informative.